Mangaluru, July 12, 2018: At long last we have a Tulu movie with a real story to tell. And it does its job remarkably well. The recent spate of Tulu films has largely relied on time-tested masala formula to satiate the masses. Their umbilical comfort zone lies in Tulu comedy drama, which the upstart industry has enthusiastically tried to morph with Bollywood and Sandalwood flavour. The industry has even invented a name for itself: ‘Coastalwood’! How convenient! Now director Abhaya Simha has dared to present his own version of what a good Tulu movie can aspire to be. His national award-winning offering ‘Paddayi’ effortlessly transports us to Shakespearean territory. Boldly announcing itself as an adaptation of The Bard’s epic tragedy Macbeth, the movie faithfully turns into an incarnation the original plot in a familiar contemporary Tulunadu setting. It tells us the story of the protagonists in an incredibly simple way without missing any of the nuances that have made Macbeth rank among the Four Great Tragedies of William Shakespeare (the others being Othello, Hamlet and King Lear). The story of Macbeth revolves around the lust for power which makes a Scottish lord’s wife force him to betray and murder the king and usurp the throne for himself. A heady mix of the supernatural and the inevitability of guilt finally catching up with the hero-villain is what made it into a fan favourite. In Paddayi, Abhaya Simha, who also wrote the story, cleverly replaces the Scots with the fishing community and skillfully weaves the story around the characters that inhabit this world. Dinesh is a fisherman equivalent of a landlord. He owns a traditional fishing fleet and he commands the total devotion and respect of the locals as well as his seamen, despite the fact that they virtually serve him as bonded labourers. Macbeth appears in flesh and blood as Madhava, Dinesh’s blue-eyed boy who is a champion spotter. Perched atop the crow’s nest, his full-time job is to spot large schools of fish in the high seas and he enjoys a well-deserved reputation for unerring accuracy. One night, while walking through the woods with Bannaje (standing in for Banquo) after a bout of drinking, he encounters a Bhootha (remember there are no witches in Tulunadu). It prophesies that Madhava will soon become a rich lord himself. Madhava’s disbelief in the prophesy is overcome when he sees his fortunes changing in unexpected ways from the very day. Meanwhile Dinesh is having his own problems. His son for whom he had dreams of bequeathing his little empire has turned a prodigal. He wants to dump his family occupation and migrate to greener pastures in Dubai. Once, in a fit of rage, Dinesh decides to draw up his last will in favour of Madhava, his trusted lieutenant whose talent (and before him, that of his father too) has enabled him to amass his fortune. After all he is impressed that Madhava has settled well with his new wife Sugandhi and he feels the couple deserve a good future. Therein begins the saga of betrayal, murder and deceit which ultimately destroys all the key figures. Okay, we all know the story anyway. So no big deal. But the triumph of ‘Paddayi’ is that it has succeeded in doing the impossible – that is, to seamlessly transform a grand, world famous yarn into a completely local narrative with a genuine Tulu flavour. In fact, the film’s title translates to ‘West’, a colloquial term implying setting out into the west facing Arabian Sea. The movie starts out on a slow note, then gains intensity at a calibrated pace. The director’s world view is also the ideal one we all dream of – be stingy on violence and extravagant on hot love-making. The suggestive dialogues we hear in the beginning and later the wife’s seduction of Madhava is extremely bold for a Tulu movie, but never stoops to the vulgar. The violence when it’s there is calculated to deliver the best effect. Abhaya Simha is a young director with three feature films to his credit. 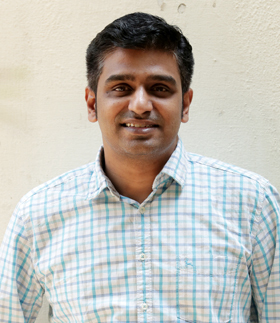 A product of Film and Television Institute of India, Pune, his debut venture Gubbachchigalu won the National Award for the Best Children’s Film for the year 2008. His second movie was Shikari, a Kannada-Malayalam bilingual project released in 2012, starring mega star Mommootty. His third film Sakkare in Kannada starring Ganesh was released in 2013. Now he has returned with Paddayi, to give a bow to his hometown, Mangalore. Paddayi is a serious film which has no intention to pander to the commercial circuit. It cuts out song and dance as well as canned jokes in favour of technical finesse. The acting, the cinematography, the haunting music by Manikanth Kadri all fit in perfectly. The director had deliberately chosen to cast fresh faces with Kannada theatre background (with the exception of Gopinath Bhat and Santosh Shetty who are Tulu movie regulars). For those unfamiliar with Shakespearean metaphor, Paddayi might double up as a horror flick too (only in a few key scenes, though inducing horror is not the intention). The new-found penchant for aerial shots, thanks to the advent of the drone camera, is used to great effect, especially in the closing scene. Then the end credits roll up. In all, a movie worth watching. Don’t worry, if you don’t know Tulu. The English sub-titles will take you through. One can only hope Paddayi will inspire more good Tulu movies in the future. Paddayi will hit the screen at local cinemas on July 13. •‘Pêcheurs du Monde’ in France, where films related to the fishermen community are screened exclusively.